Building on its history as a place of production and innovation for the U.S. Navy, the Navy Yard today is a growing community where companies and their employees thrive. Explore available properties to lease, including small offices, expansive corporate suites, and adaptable industrial buildings, and learn about options for building a custom HQ or R&D space. Plan your the Navy Yard and explore the history, architecture, events, parks, public art, riverfront, dining options, and much more. 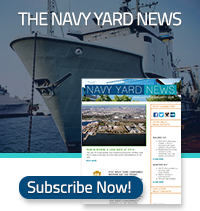 Visit the Events Calendar to learn about the Navy Yard’s community events, philanthropic races and walks, food and drink festivals, sports and wellness programs, and much more. Dubbed “the coolest shipyard in America” by POLITICO, the Navy Yard is home to beautifully-preserved brick buildings, repurposed warehouses, and award-winning, contemporary architecture alongside historic ships and green parks across 1,200 acres. The Navy Yard is considered the most successful redevelopment of a former military facility in the country, and currently features more than 7.5 million square feet of buildings housing 13,500 employees working at 150 companies. The Navy Yard is home to companies ranging from the headquarters of Urban Outfitters and GSK to technology startups, manufacturers, life sciences and corporate R&D, and a graduate engineering and research satellite of Penn State University. Home to historic structures and new high-performance and LEED certified development, the Navy Yard offers diverse, flexible building choices with varying heights, vintages, and floorplates, all powered by a nationally-recognized microgrid. The Navy Yard will support an additional 10 million square feet of commercial and residential development at full buildout. PIDC, Philadelphia’s public-private economic development corporation, is the master developer for the Navy Yard, where, since 2000, it has overseen the investment of more than $1 billion into the region’s most dynamic business community.